Designers in medical device and health industries can benefit from integrating 3D printing, machining, and injection molding from prototyping to production and even during the post-launch phase of products. Using industrial 3D printing for rapid prototyping of parts for new medical devices and other products can mean design risk reduction for developers. Rapid prototyping streamlines product development, provides iterations of multiple designs simultaneously, and reduces time to market by quickly validating designs. On the production side, parts for products ranging from instruments used in surgery to glucose monitors will frequently be produced using injection molding and CNC machining, depending on the parts. 3D printing delivers repeatability and precision in small quantities, but it is not yet conducive for production runs of thousands or millions of components. That’s where injection molding can offer advantages. Additionally, med tech developers often face demand volatility and supply chain disruptions, so leveraging on-demand production from a manufacturer can be especially beneficial in reducing a company’s inventory costs and risks, eliminating the need for forecasting, and avoiding, in many cases, minimum order quantities. Therefore, engineers and product designers in medical device and health industries can benefit from integrating 3D printing, machining, and injection molding throughout the process, from prototyping to production and even during the post-launch phase of products. A design process that plays to the strengths of 3D printing, machining, and low-volume injection molding can dramatically reduce development time to quickly bring a project from the idea stage to FDA 510(k) premarket submission, and on to verification and validation. 3D printing works well with complex designs and multipart assemblies, and supports customization of medical devices such as prostheses, dental implants, and body parts, including tracheal implants and ribs, legs, joints, and hands. It provides for accurate testing, including tests that digital analysis may miss, making it valuable for early evaluation of new medical parts. Stereolithography (SL), a frequently used additive technology, works for concept modeling and prototypes of thermoplastic-like parts. The SL process can create components that represent production parts with great detail and are useful for testing. Parts made with SL can be used for lenses, monitors, housings, and microfluidics, such as micropumps, microvalves, and other applications and products that are produced on a sub-millimeter scale. SL parts can also be used for marketing purposes, to show users in a clinic or hospital how a part will look or work. (Exposure to humidity and ultraviolet light, though, can change the properties and appearance of finished SL parts). Stereolithography is one of several additive technologies for concept modeling and prototyping of thermoplastic-like parts. This process can create components that represent production parts with great detail and are useful for testing. Selective laser sintering (SLS), another 3D printing process, uses thermoplastic nylons to produce accurate, tough parts including durable medical prototypes. SLS parts also can be used in production of difficult-to-mold components that reduce weight, cut the number of parts in an assembly, and shrink assembly time, while also, in some cases, increasing part performance. Another additive technology—direct metal laser sintering (DMLS)—can produce metal implants, specialized surgical instruments, and components with features, internal geometries or enclosed channels that would be impossible to produce with traditional casting or machining. Beyond these processes, other 3D printing applications include methods such as fused deposition modeling (FDM) and polyjet technology. Rapid machining works well for prototyping and for small quantities of end-use parts. Whether using CNC milling or turning processes, material properties with machined parts are representative of injection-molded parts. Plus, high temperature-resistant plastics such as PEEK and PEI (Ultem) work well for sterilization, so parts made of these plastics are regularly used in the medical industry. Rapid machining has a long history of working well for prototyping, small quantities of end-use parts, and high volume production. Whether one uses CNC milling or turning processes, material properties with machined parts are representative of injection-molded parts. While 3D printing provides repeatability and precision in small quantities, it is not yet conducive for production runs of thousands or millions of components. Medical device companies designing a product or device to take to market on that scale often require injection-molded components. After gaining FDA approvals using low-volume injection molding, moving to traditional high-volume molding with better per-part pricing may make sense. Making a successful transition from 3D printing to injection molding means designing a component with moldability in mind early on. That involves implementing design elements that improve part moldability like draft and uniform wall thickness. In addition to mechanical and physical properties, considerations in choosing a material include its resistance to heat, electricity, flammability, and ultraviolet light. Soft, tough, inexpensive materials such as polypropylene and polyethylene are examples of commodity resins while engineering resins range from inexpensive, impact-resistant ABS to very strong, expensive LCP and tough, moderate-cost polycarbonate. Additionally, injection-molded parts of liquid silicone rubber (LSR) are well-suited for medical products because of LSR’s thermal, chemical, and electrical resistance. LSR parts are also biocompatible, so they work well for products that have skin contact. Wall thickness: Maintaining consistent wall thickness is perhaps the most important design requirement for ensuring good injection-molded parts. Controlling this aspect helps manage the part’s appearance, weight, and strength. Walls that are too thick result in parts with areas that sink, warp, or have internal voids from pockets of air. Coring out parts to eliminate thick walls can help avoid these unsightly distortions. Draft: Adding draft or slope to vertical walls of a part can make it easier to eject from the mold. A rule of thumb is to apply 1 degree of draft per inch of depth in the mold cavity. Radii: Using radii or rounded corners can improve the flow of plastic into the mold as well as the part’s integrity. Sharp corners raise the stress on your part and hinder resin flow. Ribbing, gussets, and ramps: Including ribs and supporting gussets can increase the strength of structural parts and help eliminate warp, sink, and voids. Ribs should be 40 to 60% of the thickness of the adjacent wall. Ramps rather than sharp steps can reduce stress in shifts between thicker and thinner wall portions. Bosses: Designing a thinner wall on a boss or mounting feature that will receive a screw will eliminate sink and voids. 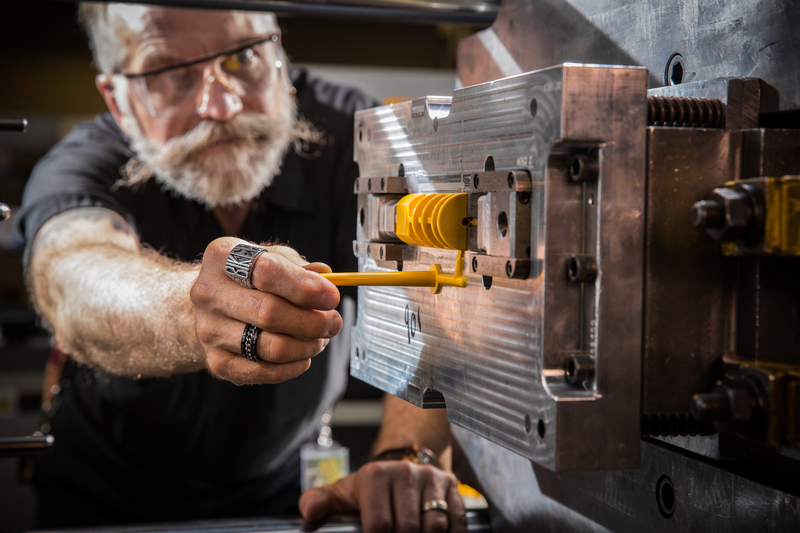 Finally, incorporating design for manufacturability into your product development process—even before you begin any actual manufacturing—will help facilitate an eventual move into injection molding. Ultimately, what’s really being addressed here is strategic management of your manufacturing supply chain. By integrating all of these methods I’ve discussed—3D printing, CNC machining, and injection molding—into your overall development process, you may find clear benefits. Rapid prototyping will reduce your design risk and accelerate your products to market. And on-demand production will reduce demand volatility for those products. Yes! Finally something about 3d desing. 3D printing is the 3-dimensional object printing technology which is the advanced printing technology generally used by engineers and researchers for a better result in their project and research. Objects can be of any geometric shape and are produced using digital model data. Thanks for the information from you. I’m looking for this. Thanks for these tips for moving to injection molding. You mentioned it’s important to try to implement design elements that could improve the moldability of a part, like a draft. It sounds important to understand how the molding process first works, especially if it affects your design.